If you want to see how rappers really live, their tour buses and trailers are usually a good place to start. Regardless of what you hear on their songs, what you see in their day-to-day environments—everything from cocaine residue, condom rappers, bibles, family members, groupies or empty boxes of Swisher Sweets—will provide a clue of what goes down during the 20 or so hours they aren’t on stage or in a recording studio. Seeing Lecrae and Derek Minor walk the grounds of the Glen Helen Regional Park—the dusty, mountainous area that annually hosts “Rock The Bells: Los Angeles”—they’re almost indistinguishable from the rest of the dozens of rappers in the area. The only visible powder in their trailer is probably of the Johnson & Johnson variety, but there are also no bibles out or Creflo Dollar sermons blaring in the background. Grammy Award-winning producer Street Symphony ambles on to the bus in a tank top with the biblical image of Jesus embroidered on the front, but he’s also partaking in a Heineken, as pretty much any other grown man would on a Saturday after work. If you’re looking for “Christian rappers” or “Gospel emcees,” you may be better off waiting for the annual Dove Awards. Lecrae and fellow Reach Records emcee Derek Minor are two men who rap as their chosen profession. And a lot of those raps reference their chosen faith of Christianity. But they deal with the same issues as pretty much anyone else in Hip Hop. Those issues include the ever-present, “Hey, I know someone who raps” sales pitch. In fact, that pitch is how Lecrae and Minor met. Part of the trade-off for winning a Grammy for “Best Gospel Album” means being labeled. But, much like witnessing rappers in their everyday surroundings, spending time with Lecrae and Minor will reveal more than any song. 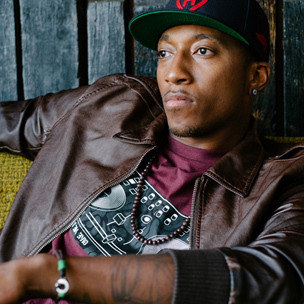 HipHopDX: Lecrae, tell me about the first time you either met Derek or heard his music. Lecrae: The first time I heard Derek’s music, I was living in Memphis. My sister actually hit me up, because she lives in the Nashville area near him. My sister was really cool with his wife, and they were kicking it. She was like, “You gotta listen to this dude, because he reminds me of you. He can really rap; you gotta listen to him.” Usually, I’m like, “Whatever, man…I don’t care.” But that was my sister, so the mentality was, “For you, I’ll do it. But I know you don’t know good music like that.” I threw her all under the bus, right? Derek Minor: I forgot all about that! But I was definitely like, “Let me borrow this beat, Lecrae.” I never thought buddy would hear it. It was crazy. DX: So Derek, you represent the flip side of this experience. Just as a general fan of Hip Hop, when did you first come across Lecrae? Derek Minor: Here’s a funny story about this dude, and this is true to this day. I know his sister, and we went to church together. We were in Nashville and getting ready to move to Memphis, and his sister was like, “Yo, you gotta mess with my brother. My brother raps.” And, I’m like, “Everybody raps. I don’t care nothing about this dude; I rap too.” So I get out there, and when I’m out there with him, I’m like, “Yo, this is your boy Derek. Your sister said holler at me.” I called this joker five times, and this mug never called me back. So my feelings are basically, I don’t fool with this dude. DX: Derek, I listened to “Gimmie” and you address materialism and prosperity gospel among other things. How much do think these issues are unique to the black community or even Hip Hop in general for that matter? What we’re seeing in our communities is people saying, “Well damn, we’ve been nothing for so long that I’m going to fight to try to be something.” So we fight to get the chains and make as much money as we can. That makes you look at yourself and say, “Dang, man. I just gotta get money, because that way people will respect me.” But I think what’s happened is that we’ve put our identity into trying to fight to be accepted. That’s crept into the gospel. I think it first came out as a way for people looking to give hope. So how do you think you give poor people hope? You tell them, “Hey, one day you can be rich. One day you don’t have to be poor.” And although I think it’s good that we want to help anyone, at the end of the day, our hope has to be in Jesus. What we’re seeing now is people getting rich and saying, “We’re getting money, and we’re getting everything that we want.” But when you look at the state of our community, it’s not much better than it was 50 years ago. Now we just look like we’re rich, but it’s superficial. So the whole idea behind the song “Gimmie” is, “How much is enough?” We’ve put all our stock in the concept of “Let’s Get Money,” but after we got it, look what happened to our communities. Look at Chicago. More people were killed in Chicago this year than in Iraq. So, what is it amounting to? DX: [Laughs] Well one thing that wasn’t necessary revolutionary but definitely an innovative take was “Dear Mr. Chrisitian.” Since we were talking about Dee-1 prior to the interview, tell me how that collaboration happened? Lecrae: I went on tour with Dee-1, so we had these conversations on a regular basis. We talked about everything, and we got into a debate about New Orleans music versus Texas music. Texas won. But then we started talking about faith and people’s perspective, and there was some cats on tour with us that weren’t Christian. They got to chime in and state their perspective of how they see Christians approach them. It was dope to be able to have those conversations and talk in those circles, and we really connected. So the tour ended in Atlanta, and [Dee-1 and Derek Minor] got to connect in the studio. Lecrae: Oh, the song was special. It is true. Everywhere we go, people do things and go, “Is that cool? Oh, let me keep that away from you.” And I think they think we’re better than them. The perception is, “Oh, you’re a Christian. You look down on me.” But that’s so not Christianity. Not to get extra deep and theological on you, but we’re just people who admit we don’t have it together. That’s really all we are; we’re like, “Yo, I need a savior.” We’re not people who say, “I’m better than you, because I do this, this and that.” We just come to grips with the fact that we’re not perfect. So we just wanted to tell the story from the perspective of, “Y’all think y’all better than me,” because there are those people who point their finger at you. They’ll call you a backslider, a heathen and tell you you’re going to meet the devil. It’s about grace, and it’s about love, and that’s all we want to do—show love. DX: That said, this is still a very competitive sport. As you were coming up and formulating your styles, what kind of process did you go through putting rhyme patterns together and things of that nature? Lecrae: I just ate dudes up on the playground—I’m gonna be honest. I’m six foot four, and I can hoop, but I ain’t just cold. So I wasn’t the best at basketball, and I wasn’t a football player. I wasn’t in the band, and I didn’t have a wicked jump-shot. So I only had one other option. For me, Hip Hop and rapping was my social currency. That little wiry, skinny dude who’s alright on the basketball court, who gets in trouble in class—we don’t really pay much attention to him. But did you see him at the lunch table? He murdered that dude! DX: What about you, Derek? So I just started improving and being less entrepreneurial and focusing on the art. Obviously, back when I was in college, Cassidy was killing it. Fabolous was on his mixtape game, and Eminem was the dude when I was growing up. So I would watch those battles and just watch dudes go at it. I made it a point to listen to Jay Z and everybody. So that made me fall in love with the art of rapping and being competitive. DX: Lecrae, you’ve mentioned being a revolutionary in previous interviews. Tell me what that term means to you? Lecrae: A revolutionary is a change agent, and that’s really what I’m about. I’m about change. Hip Hop has always been a social platform for change. If you think about any other form of music—we’re not really interested in One Direction’s back-story. But we want the back-story of people like Eminem and Jay because of the struggle and that sense of progress. That’s what Hip Hop has always been about, and that’s why there’s no better tool to use than Hip Hop music to be a revolutionary. It allows you to be a change agent to talk about how our communities can be better and how life can be better. My mother—who was influenced by the Black Panthers, raised me. I was made to read all kind of revolutionary books as a kid. What 12-year-old do you know that sits and reads The Autobiography of Malcolm X? So that’s how I came up, and that’s why Tupac resonated with me so much. As gangster and thuggish as he was, he still wanted to be revolutionary. And that’s how I am. As clean and wholesome as I may be, I’m a revolutionary man. I want change to happen. DX: Those elements don’t necessarily have to be mutually exclusive. Lecrae: Exactly! I don’t feel like they need to be at all. Look at Martin Luther King Jr. Come on, now. I believe we can do a lot with this music, and I challenge artists I see all the time. If you give me any room to speak, I’m gonna challenge you to use your platform for change. I’m not saying you have to, but you should consider that reality. DX: It’s an option. I’m assuming part of the reason Derek is here now is because he considers that reality. Derek, you begin your latest project with “Lost In Minorville,” where you joke about this perfect world where birds don’t poop on your car. How do you balance that sort of blind idealism with just hoping for something better? Is there a happy medium? Derek Minor: Man the whole irony of “Lost In Minorville” is that it’s clear this is not real. The irony of the situation is that’s how we all present ourselves to people. Right now, I’m in this interview, and I’m trying to put my best foot forward. I’m thinking about how to make this interview the best when we connect [laughs]. That’s just how we do, and it’s normal. But the truth is we all got junk, and we’re all messed up. I think the wrestle is to realize because God made us and loves us, that’s why I’m good. That’s why I’m accepted. I’m accepted by him whether HipHopDX or anybody else doesn’t accept me. I’ve got my flaws, and I’m messed up—we’re all messed up if we really put our cards on the table. But at the end of the day, I am who I am. I can’t be no different. I’m no better than you, and you’re no better than me. The only thing is that I’ve got my faith in God, and I pray to him that one day I’ll see his face. That’s my whole thing. It’s a promise that Jesus is coming back, and it’s gonna be a world where birds don’t poop on your car. At least that’s what I believe.